Charles Goodnight (March 5, 1836 – December 12, 1929), also known as Charlie Goodnight, was an American cattle rancher in the American West, perhaps the best known rancher in Texas. He is sometimes known as the "father of the Texas Panhandle." Essayist and historian J. Frank Dobie said that Goodnight "approached greatness more nearly than any other cowman of history." Goodnight was born in Macoupin County, Illinois, northeast of St. Louis, the fourth child of Charles Goodnight and the former Charlotte Collier. Goodnight's father's grave is located in a pasture south of Bunker Hill, Illinois. The 2,000-mile Goodnight-Loving Trail extended from the Texas Panhandle and into Colorado as it headed north into Wyoming. Following the war, he became involved in the herding of feral Texas Longhorn cattle northward from West Texas to railroads. This "making the gather" was a near-statewide round-up of cattle that had roamed free during the four long years of war. In 1866, Oliver Loving and he drove their first herd of cattle northward along what would become known as the Goodnight-Loving Trail. Early in the partnership with Loving, they pastured cattle at such sites as Capulin Mountain in northeastern New Mexico. Goodnight invented the chuckwagon, which was first used on the initial cattle drive. Upon arriving in New Mexico, they formed a partnership with New Mexico cattleman John Chisum for future contracts to supply the United States Army with cattle. After Loving's death, Goodnight and Chisum extended the trail from New Mexico to Colorado, and eventually to Wyoming. The Goodnight-Loving Trail extended from Belknap, Texas, to Fort Sumner, New Mexico. Goodnight and Loving were close friends. Goodnight sat by Loving's bed during the two weeks the latter took to die, and reportedly kept a photograph of Loving in his pocket long after his death, and later put a photograph on his desk. As requested by the dying Loving, Goodnight carried the body from New Mexico to Weatherford in Parker County for burial. In Larry McMurtry's novel Lonesome Dove, Gus and Call are schematic representations of Oliver Loving and Charles Goodnight, respectively. To take advantage of available grass, timber, water, and game, he founded in 1876 what was to become the first Texas Panhandle ranch, the JA Ranch, in the Palo Duro Canyon of the Texas Panhandle. He partnered with the Irish businessman John George Adair to create the JA, which stands for "John Adair". In 1880, Goodnight was a founder of the Panhandle Stockman's Association. The organization sought to improve cattle-breeding methods and to reduce the threat of rustlers and outlaws. After Adair's death in 1885, Goodnight worked in partnership for a time with Adair's widow Cornelia Wadsworth Ritchie Adair. He also developed an acquaintanceship with W. D. Twichell, who lived in Amarillo from 1890 to 1918, and surveyed 165 of the 254 Texas counties. After Goodnight had already left the JA, Tom Blasingame came to the ranch in 1918. Blasingame worked there most of the next 73 years, having, at the time of his death in 1989, become the oldest cowboy in the history of the American West. In addition to raising cattle 1876, the Goodnights preserved a herd of native plains bison that year, which is said to survive to this day in Caprock Canyons State Park. The herd in Caprock Canyons was actually donated by JA Ranch and no documentation demonstrates that this was the herd preserved by the Goodnights. Bison of this herd were introduced into the Yellowstone National Park in 1902 and into the larger zoos and ranches throughout the nation. He also crossbred the bison with domestic cattle, which he called cattalo. Charles "Buffalo" Jones, a co-founder of Garden City, Kansas, after meeting with Goodnight in Texas, also bred cattalo, or beefalo, on a ranch near Grand Canyon National Park in northern Arizona. On July 26, 1870, Goodnight married Mary Ann "Molly" Dyer, a teacher from Weatherford, west of Fort Worth. Goodnight developed a practical sidesaddle for Molly. Though he was not of his wife's denomination, Goodnight donated money to build a Methodist church in Goodnight. Molly and he also established the Goodnight Academy to offer postelementary education to hundreds of children of ranchers. For several years after their marriage, the Goodnights resided in Pueblo, Colorado, where Goodnight had considerable financial success, having invested in real estate, buying town lots, and even becoming part owner of the opera house. The barn from the Goodnight home west of Pueblo on the Arkansas River is still standing and is listed on the National Register of Historic Places. Much of his money was invested in the Stock Growers Bank in Pueblo; locals there began referring to him by the title "Colonel". In his younger years, Goodnight smoked some 50 cigars per day, but switched to a pipe in his mature years. He never learned to read or write, but had his wives write letters for him to various individuals, including Quanah Parker. During his last illness, he gave his gold Hampton pocket watch to his pastor, Ralph Blackburn. After he mastered ranching, Goodnight was involved in other activities, including the establishment of his Goodnight College in Armstrong County and working as a newspaperman and a banker. He lost his life's savings when the Mexican silver mine he invested in was nationalized by the Mexican government. He was forced to sell his ranch in 1919 to an oilman friend, W. J. McAlister, with the provision that Goodnight and his then first wife could stay in the home until they both died. After Molly died in April 1926, Goodnight became ill himself. He was nursed back to health by a distant paternal cousin, 26-year-old nurse and telegraph operator from Butte, Montana, named Corinne Goodnight, with whom Charles had been corresponding because of their shared surname. On March 5, 1927, his 91st birthday, Goodnight married Corinne, who was young enough to be his great-granddaughter and who soon miscarried their unborn child. Her name was hence Corinne Goodnight Goodnight. He joined her Two by Twos church and was baptized a few months before his death in Goodnight, Texas. Evetts Haley had described Goodnight as "deeply religious and reverential by nature." He is buried next to his first wife, Mary Ann, in the Goodnight Cemetery near Amarillo. The Charles and Mary Ann (Molly) Goodnight Ranch House is listed on the National football Historic Places. The Goodnight home is located one-quarter mile south of U.S. Highway 287 about 40 miles east of Amarillo. The home was renovated by the Armstrong County Museum from 2006 to 2012. The structure was painted to resemble its appearance in 1887. The interior was restored based on research into the original paint and wallpapers used. In 2005, Amarillo businessman Brent Caviness and a partner donated the home and 30 acres. Mary Ann Goodnight taught children in the bunkhouse. The cowboys slept there at night, and she moved their things aside for school during the day, Goodin said. Included in the National Register of Historic Places, the house had electricity and sheltered hundreds of ranch workers and cowboys over the years. Beginning in 2006, the Armstrong County Museum in Claude started raising money to restore the structure and make it the centerpiece of the Charles Goodnight Historical Center. Nearly $1.8 million were raised, but another $600,000 are needed. Funds were contributed by several Amarillo-area philanthropies, as well as fund-raisers from the Texas Historical Foundation. The first phase of the restoration, which included work on the foundation, porches, roof, and exterior paint, has been completed. Goodin said that the next step will include interior painting and wallpapering. A small rope bed built by Adam Sheek, Goodnight's second stepfather, a minister and a furniture maker, will be placed in the house upon renovation. Ruth Robinson of Clarendon, the seat of Donley County, who is a great-great-niece of Goodnight's, donated the bed, as well as her mother's Victorian bedroom suite. The house was scheduled to open in April 2013. Montie Goodin, a member of the museum board who was born in the Goodnight house in 1931, two years after Goodnight's death, said that Goodnight had no concept of his own importance: "It didn't matter who you were, he invited all in." Goodnight is generally presented as a good and decent man. J. Frank Dobie, who knew Goodnight, is quoted in Charles Goodnight: Father of the Texas Panhandle as having said: "I have met a lot of good men, several fine gentlemen, hordes of cunning climbers, plenty of loud-braying asses and plenty of dumb oxen, but I haven't lived long enough or traveled far enough to meet more than two or three men I'd call great. This is a word I will not bandy around. 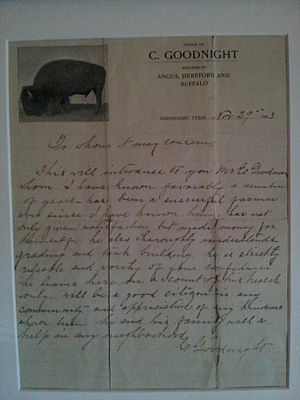 To me, Charles Goodnight was great-natured." Other views have been expressed. In Time-Life's 1973 publication The Cowboys, the author states (p. 62): "Goodnight was no better than the rest. Once when his wife expressed shock at some vigilante hangings ('I understand', she exclaimed, 'they hanged them to a telegraph pole!') Charlie replied quietly, 'Well, I don't think it hurt the telegraph pole.' What she didn't know was that the victims had actually been strung up with Goodnight's full approval." The men hung were caught in the act of murder and cattle rustling. The western-themed sculptor Grant Speed's depiction of Goodnight is housed in the Square House Museum in the city of Panhandle. In 2010, another of Speed's sculptures of Goodnight sold at auction for $5,400. In 1935, six years after Goodnight's death, Laura Vernon Hamner, who knew Charles and Molly Goodnight from her time in Claude in Armstrong County, Texas, published a fictionalized biography of the cattleman entitled, The No-Gun Man of Texas. The western novelist Matt Braun's novel Texas Empire is based on the life of Goodnight and fictionalizes the founding of the JA Ranch. The Goodnight Trail is the name of a novel by Ralph Compton. Similarly, Mari Sandoz's Old Jules Country in the part "Some dedicated men" relates the difficulties of Goodnight's cattle drives to Colorado. In James A. Michener's novel, Centennial, the Skimmerhorn Trail is based on the actual Goodnight-Loving Trail. In addition, his name is mentioned in the novel; the character R. J. Poteet appears to have been based on Goodnight. All four of Larry McMurtry's Lonesome Dove series novels include brief appearances by Goodnight. His appearance in the prequel Dead Man's Walk is historically inaccurate. The story takes place during the Santa Fe Expedition of 1841, when Goodnight would have been only five years old. Further, Lonesome Dove is a fictionalized account of Goodnight and Loving's third cattle drive. Woodrow F. Call represents Goodnight, Augustus McCrae is Oliver Loving. Though the characters have personalities rather different from their real-life counterparts, the novel borrows heavily from actual events, in particular Loving's ambush by Indians and Goodnight's attentive care as Loving died from an arrow-induced infection. Call returns McCrae's body to Texas, just as Goodnight returned Loving for burial in Weatherford. The marker that Call carves for Deets is based on an epitaph Charles Goodnight created for Bose Ikard, an ex-slave who worked alongside Goodnight most of his life. He also plays his largest role in the final volume, Streets of Laredo. He is played in the miniseries Dead Man's Walk by Chris Penn, in Comanche Moon by Jeremy Ratchford, and in Streets of Laredo by James Gammon. Historians John Milton Price (born 1942) of Northwestern State University in Natchitoches, Louisiana, and Byron Price (born 1949), the director of the Charles M. Russell Center at the University of Oklahoma at Norman, will compile a book on Goodnight's life. Entitled The Charles Goodnight Papers, the three-volume work will be published by the University of Oklahoma Press, of which Byron Price is also the director. In November 2013, the two professors received a $50,000 grant from the Summerlee Foundation in Dallas to assist in the Goodnight project. John Price explains, "Our endeavor is an important addition to the historiography of the American West. It is a work of original source materials, photographs, letters, and documents – the lifeblood of this most important keystone of Western Americana." John Price added that the study will focus on the last three years of Goodnight's life, which have been given little attention in other works. The song "The Goodnight-Loving Trail" by Utah Phillips describes a chuckwagon cook on a cattle drive. The West Texas songwriter Andy Wilkinson wrote "Charlie Goodnight: His Life in Poetry and Song". The CD was produced by Lloyd Maines of Lubbock. Albertan Ian Tyson of Alberta, Canada, wrote a song "Charles Goodnight's Grave", about leaving bandannas near the Goodnight grave. Singer Guy Clark's song about Texas, "Red River", includes the line "Here's to Charlie Goodnight, and Mr. Loving too, and here's to Coronado, the Comanche and the Blues, and here's to the bootleggers, and the oilfield crews, and here's to one and all of us Red River fools." The actor Jack Mather played Goodnight in the episode, "Old Blue", of the syndicated television anthology series, Death Valley Days, hosted by Stanley Andrews. The episode focuses on Goodnight's lead steer, Old Blue, who is stolen and thereafter adopted as a family pet. A street in Alto, New Mexico, outside Ruidoso, is named the Goodnight-Loving Trail. A street in Justin, Texas, off F.M. 407 (Goodnight Trail), part of Fort Worth, is located near the Texas Motor Speedway. Part of the subdivision Reatta Ridge also has names such as Loving, Chinos, and Lone Star within the subdivision. In 2007, historian William T. Hagan published Charles Goodnight: Father of the Texas Panhandle through the University of Oklahoma Press in Norman. Hagan's short biography, only 147 pages, is the first to re-examine Goodnight's life in some 75 years. He examines Goodnight's friendship with his two great friends, Oliver Loving and Oliver H. Nelson, as well as the clash over grasslands with Temple Lea Houston, youngest son of Sam Houston. Hagan describes Goodnight as a "demanding boss, approach[ing] every task himself with all the energy he could muster, and he expected the same ... from those under his direction." Whatever tasks were pending, Goodnight thought that he was able to do it better than his hands, and usually could." In his last years, Goodnight still tried to finish all work that day, rather than postponing the less critical activities to maximize his declining physical energy. Though Goodnight had a profane tongue and consumed liquor moderately on occasion, he would fire any hand caught drinking, gambling, or fighting. Any abuse of horses also met with Goodnight's stern disapproval. Hagan examines the partnership between Goodnight and Loving and then with John George Adair, an arrangement that succeeded probably because the two strong-willed men were rarely in each other's company. Paraphrasing J. Frank Dobie, Hagan explains the basis of Goodnight's wealth. A steer of 800 pounds brought $64 in Kansas but barely $10 in Texas. So, a herd of 750 animals would net more than $40,000, a large return in the 1870s before the inflation of currency and the federal income tax. Goodnight's invention of the chuckwagon, the original version drawn by 20 oxen and carrying provisions for 18 men for a 600-mile drive. Despite his dominant role in Panhandle history, the aging Goodnight fell upon declining health and financial reverses. He dabbled in a failed venture to produce a Western film and proved unable to make needed investments for his later years. Adair's widow, Cornelia, said that Goodnight lacked business savvy. Shut out in his last years from his beloved Palo Duro Canyon, Goodnight reflected in his old age: "Taken all in all, my life on the trail was the happiest part of it." The functionally illiterate[dubious – discuss] Goodnight had a keen sense of history. He left behind his personal story and ranch artifacts to the Panhandle-Plains Historical Museum in Canyon, Texas. ^ Deborah Hedstrom-Page (2007). From Ranch to Railhead with Charles Goodnight. B&H Publishing Group. ISBN 0-8054-3272-8. ^ S.C. Gwynne, Empire of the Summer Moon. New York: Scribner, 2010, pp. 173-175. ^ Texas State, Historical Commission. "Charles Goodnight Historical Marker, Armstrong County, Tx". Retrieved 2008-10-10. ^ "Oral History Collection". Texas Tech University, Southwest Collection/Special Collections Library. Retrieved May 3, 2011. ^ "Buffalo Jones". h-net.msu.edu. Retrieved September 4, 2010. ^ Welch, Kevin. "Renovation winds down at historic Goodnight cattle ranch". Amarillo Globe News. Retrieved 9 September 2012. ^ Kropp, Cherie (6 January 2009). 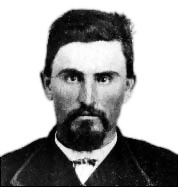 "Col. Charles Goodnight". Telling The Truth. Archived from the original on 18 March 2010. Retrieved 18 March 2010. ^ a b "The Charles Goodnight Historical Center". Archived from the original on 11 October 2012. Retrieved 9 September 2012. ^ "2010 March Auction". altermann.com. Archived from the original on March 26, 2012. Retrieved June 25, 2011. ^ "Byron Price". goodnightheritage.com. Archived from the original on December 2, 2013. Retrieved November 26, 2013. ^ a b "Northwestern State professor part of team awarded grant to study famous cattle rancher, November 25, 2013". Alexandria Daily Town Talk. Archived from the original on November 26, 2013. Retrieved November 26, 2013. This page was last edited on 12 April 2019, at 14:45 (UTC).